The product of sloppy excavation works recently conducted at the Cummings/Cowan Street Canal. Only three quarters of the waterway were cleared of the vegetation and the remainder has since reclaimed most of the canal. 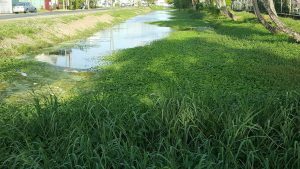 Drainage and irrigation channels in and around Georgetown will undergo a series of rehabilitative works while some will be cleared as the city prepares for the May-June rains. 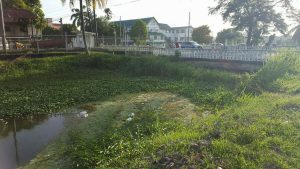 Word of plans to improve the drainage system ahead of the next rainy season came several weeks after the Ministry of Public Infrastructure conducted a sloppy cleaning of the Cummings Canal/ Cowan Street canal. An excavator only cleared about three-quarters of the canal and even left a whole section packed with thick vegetation. Since then, the weeds and vines that had been left behind have taken over almost the entire waterway again. It is unclear how much money was spent by the Ministry of Public Infrastructure on such a sloppy job. Minister of State, Joseph Harmon, at a post-Cabinet media briefing on Thursday, at the Ministry of the Presidency, said government has approved $150M for drainage works in priority areas. “A sum of $150M was approved by Cabinet for works to the following areas: the de-silting of the Sussex Street drain, de-silting of the drain and culverts along the Railway Embankment from Sheriff Street on the west to the pump station on the east, the clearing of six culverts that connect the North Ruimveldt and South Ruimveldt drainage systems, the clearing of the siphons and attendant drains in the Plum Park Sophia area, repairs to the Meadowbank sluice and clearing of the Meadowbrook channel inlet, repairs to sluices at Agricola, Rome and Lamaha Street and clearing of the inlet channels(and) clearing of drains in the Newtown area,” Minister Harmon detailed. The National Drainage and Irrigation Authority’s (NDIA’s) Technical team highlighted these areas as key locations for rehabilitative works. The drainage process will now be more efficiently able to allow possible flood waters to be drained from across the city in a timely manner, Minister Harmon explained. These works are expected to commence immediately, and will be completed before the arrival of the May-June rains. Minister Harmon further noted that this is the first of a series of actions taken by a recently established task force which will oversee the rehabilitation of drainage systems in the capital city. A section of the Cummings/Cowan Street Canal that was not cleared of the thick vegetation during recent excavation works. Additionally, the task force will, “execute plans in the short, medium and long-term to prevent flooding of the city in times of heavy rainfall in the future,” the Minister of State concluded. The drainage and irrigation programme is factored into the Hydrometrological services’ budget of the Ministry of Agriculture of approximately $603M. The establishment of the task force was made during a Cabinet meeting earlier in January. The task force comprises representatives from the Georgetown Mayor and City Council, the Ministries of Agriculture, and Public Infrastructure and the NDIA. The work of the task force will be guided by the recommendations presented by the team of Dutch engineers which will be used in finding effective drainage solutions for Georgetown. Last July, the Dutch Risk Reduction team presented a report for the modelling of an effective and efficient drainage system for the city of Georgetown to the Minister of Public Infrastructure.